The Republic of Sudan is a large country in northeastern Africa. Sudan shares borders with Egypt, Libya, Chad, the Central African Republic, South Sudan, Ethiopia, and Eritrea. The climate in Sudan is arid with a number of deserts, including the Nubian desert in the north and the Libyan desert in the West. Access to potable water remains a challenge for many inhabitants. The main water source in Sudan is the Nile, which originates in Sudan at the meeting of the White Nile and the Blue Nile and then flows northward to Egypt. 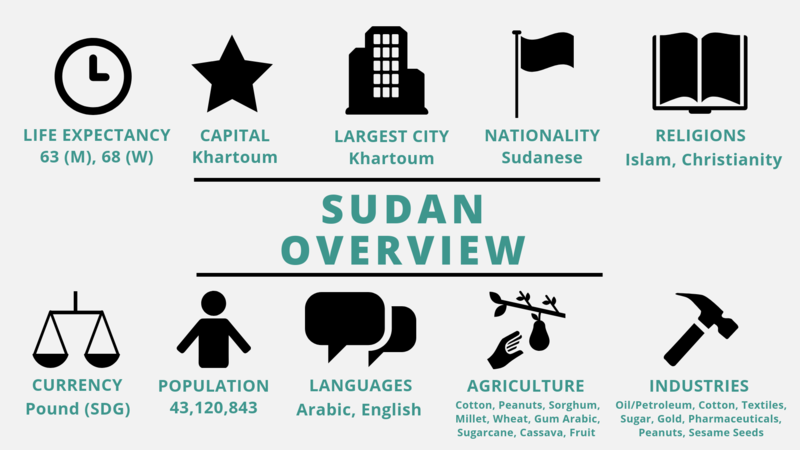 The name Sudan means “blacks” and it comes from the centuries-old Arab designation of the area as “bilad al-sudan,” or “the land of the blacks,” in reference to the dark-skinned inhabitants. The term sudan was considered pejorative until it was reclaimed in the twentieth century by anti-imperialist nationalists. Sudan was once the home to a number of powerful African kingdoms. The first, the Kingdom of Kush, was founded around 1500 BCE, although sources differ on the exact date. In the eighth century BCE, the Kushite kings conquered Egypt and established Egypt’s twenty-fifth dynasty, also known as the Nubian dynasty. The pyramids that still remain in Meroe, the capital of Kush, testify to the Egyptian influence on the kingdom. Between the third century BCE and the third century CE, Kush was controlled primarily by female rulers who bore the title of “Candace.” One notable queen, Amanirenas, engaged in protracted battles with Augustus Caesar, who had recently conquered Egypt. She was eventually able to negotiate favorable terms with Caesar. The Kingdom of Kush was eventually defeated by the Kingdom of Aksum, whose land covered modern-day Ethiopia and Eritrea, in the third century CE. The Funj Sultanate ruled much of Sudan, and parts of Ethiopia and Eritrea from 1504 until 1820. Very early on, the sultans converted to Islam and, although the Sudanese had been exposed to Islam as early as the seventh century through Egypt, they played an important role in the Islamization of the population. 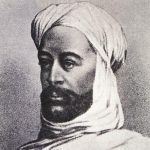 Muhammad Ahmed, commonly referred to as al-Mahdi. In 1820-21, the northern part of the country was invaded by the Ottoman Empire, who set up a Turco-Egyptian administration. In 1881, a popular revolt against the foreign government sprung to life, led by Muhammad Ahmed. Ahmed claimed that he was the Mahdi, a messianic figure from Islamic apocalyptic tradition. The governor-general of Sudan at the time, Charles Gordon, was an Englishman appointed by the Egyptian government. When the Mahdi’s revolution successfully conquered the capital city of Khartoum and beheaded Gordon, an outcry went up in England. The Mahdist government lasted for eighteen years before the British returned. They defeated the Mahdi’s successor, Khalifa Abdullahi, and set up a joint British-Egyptian rule. 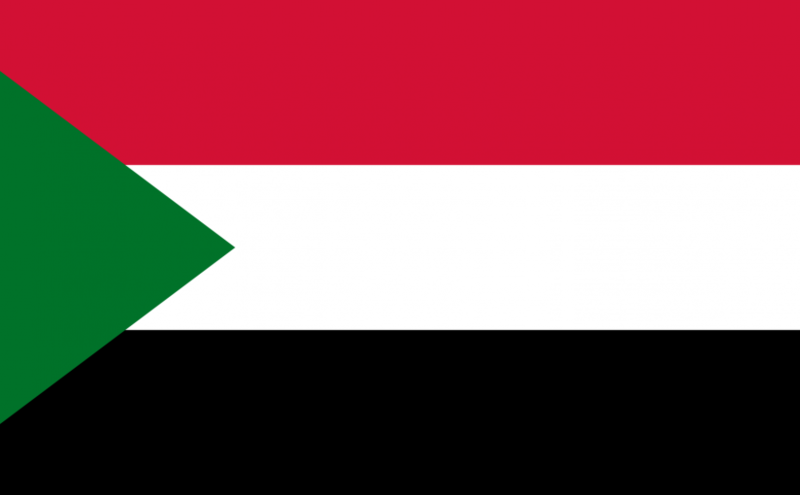 Sudan gained its independence in 1955 in the postwar wave of anti-imperialism. The democratic government established when the British left lasted three years before being deposed by a military coup. Since then, most governments in Sudan have come to power through military action, with the exception of one democratically elected government in 1986. Sudan is led by President Omar Hassan al-Bashir. In 1989, he led a bloodless military coup and became the chairman of the transitional government, the Revolutionary Command Centre for National Salvation (RCC). In 1993, he appointed himself president. Three years later, he ran for the position unopposed and was elected. He has since been re-elected multiple times. Al-Bashir is an Islamist, and he established sharia rule when he came to power, a decision which was unpopular with Christians and followers of indigenous religions. Sudan is a presidential republic with a bicameral National Legislature. The Council of States has 54 members that are members indirectly elected by state legislatures. The National Assembly has 426 members, half of which are directly elected and half of which are picked from specific categories; i.e. there are 128 seats reserved for women and 85 chosen elected through proportional party representation. The International Criminal Court has issued warrants for al-Bashir’s arrest in 2009 and 2010. He is accused of crimes against humanity for his government’s actions during the civil war in Darfur. The ICC prosecutor argued that al-Bashir “masterminded and implemented a plan to destroy” several non-Arab ethnic groups in western Sudan. The long-running civil war in Darfur, which began in 2003, has resulted in the displacement of nearly two million Darfuris and the deaths of tens of thousands more, according to the UN. The conflict in Darfur has traditionally been explained as an ethnic dispute between Arabs and non-Arabs. However, Arab in this context means belonging to ethnic groups that speak Arabic and claim Arabic ancestry. Both sides of the conflict are Black Africans and most everyone involved is Muslim. Darfur is in the west of Sudan. The conflict there is distinct from the conflict with South Sudan, which led to that country’s secession in 2011. Violence between South Sudan and the Sudanese government based in the north began in 1955, while Sudan was still under British rule. The people of South Sudan mostly practice indigenous religions although there is a Christian minority. They belong to non-Arab African ethnic groups. There are more than 610, 000 Sudanese refugees in Chad, Ethiopia, C.A.R., Egypt, Kenya, and South Sudan; at the same time, Sudan hosts around 507,000 refugees, most from South Sudan (CIA, 2017). Al Bashir’s government has traditionally had an antagonistic relationship with the United States. However, that may be changing; in 2017, President Donald Trump lifted much of the economic sanctions that the US had maintained against Sudan since 1997. Khartoum has also recently utilized its strategic geographic position to strengthen its relationships with many European states. Although the EU still technically maintains sanctions against Sudan, it has indirectly funneled around $131 million into the country in exchange for the Sudanese government’s efforts to staunch the flow of refugees, many of whom cross through Sudan on their way to Europe. Although Sudan traditionally supported Iran in the longstanding Saudi-Iranian rivalry, it has recently switched sides. For years, Iran and Sudan, both persona non grata in the West, have been allies, but the Saudi willingness to invest billions in an economically weak Sudan has tipped the scales in their favor. Khartoum cut ties with Tehran in 2016 and has continued to send troops to fight with the Saudi-led coalition in Yemen. Most of the population — 80 percent of the labor force, according to the CIA World Factbook — earns their living through agriculture. Sudan’s most important agricultural product is Arabic gum; it produces between 75 and 80 percent of the total world output. It also grows cotton, sugar, millet, wheat, and more. The secession of South Sudan in 2011 struck a serious blow to the Sudanese economy, stopping three-quarters of total oil production and consequently reducing the availability of foreign currency. The Sudanese pound was formally devalued in 2012, and the currency’s loss of value has continued steadily since, as has massive inflation. In 2018, the country has been facing serious cash shortage problems, with many banks and ATMs simply running out of money. The government has imposed strict withdrawal restrictions. Currently, at 68 percent, Sudan has one of the highest inflation rates in the world. The spike in inflation has coincided with steeply rising prices of most goods, including everyday food items, adding up to an economic crisis. The problems with oil production and the value of the pound are exacerbated by conflict in various regions of the country and a lack of infrastructure for supporting industry. All in all, there is a serious economic crisis in Sudan. Although exact numbers are not known, the CIA estimates that in 2017, the unemployment rate was 19.6 percent. In 2014, the World Bank estimated that half of the population lives below the poverty line. Sudan has an estimated population of 37,345,935, around 70 percent of whom are Sudanese Arab, meaning that they are Arab-speaking and claim descent from Arab lines, and the rest belong primarily to non-Arab African ethnic groups, including Nubian, Ta Bedawie and Fur ( (2017, CIA). The official languages are Arabic and English, but other languages, such as Nubian, are still spoken. The vast majority are Sunni Muslim, although there is a small Christian minority. According to the World Health Organization, life expectancy at birth is 63 for men and 67 for women. The population is quite young; the median age is 19, and 41 percent of the population is under 15. Although education in Sudan is both free and mandatory, many children do not attend school. The number dips dramatically with age from 76 percent of children attending primary school to 28 percent attending secondary school. UNICEF suggests a number of reasons for the lack of enrollment: government funding might not fully cover costs so parent associations might ask for fees or families might need to purchase uniforms and textbooks. Additionally, gender can be an obstacle; long walks to school might be unsafe for girls and some schools do not provide adequate access to water and sanitation facilities so girls sometimes lose significant instruction time monthly and therefore fall behind. There is also the problem of the labor foregone when girls are at school rather than helping their families. According to UNESCO, 65.81 percent of Sudanese people between 15 and 24 years are literate, compared to only 24.27 percent of those over 65. Most Sudanese are Sunni Muslims. Historically, Sufism has hugely influenced much of the country’s experience of Islam. Sufism is a dimension of Islam that emphasizes personal connection to God and learning through devotion to one’s teachers. The impact of this philosophy on Sudan can be seen in the domes that dot the country, saints’ tombs that often draw visitors and supplicants. Mahmud El Zain claims that Sufism entered Sudan in the early sixteenth century under the Funj sultanate. There are many, many Sufi sects still in existence in Sudan, including the influential Tijaniyya and Khatmiyya sects. More recently, the influence of Saudi Arabia and Wahhabism has affected Sudanese Islam. Many young Sudanese men, like men in other nearby countries, have been traveling to Saudi for work since the 1970s. Additionally, Saudi cultural institutions, such as banks and Saudi-funded schools, have become commonplace in Sudan. This has resulted in clear changes, such as the unacceptability of public consumption of alcohol and the adoption of the hijab (Bernal, 1994). The staple Sudanese food is a stew called mulah, served with kisra or ‘aseeda. Kisra is a very thin bread, made from durra or wheat. ‘Aseeda is a porridge-like food made of wheat flour or corn. There are a variety of stews, made from combinations of meat, tomatoes, peanut butter, yogurt, and more. Different areas of the country have regional specialties, such as the wheat flour gourassa in the north, the Ethiopian-influenced banana paste moukhbaza in the east, and the use of the cereal, dukhun, in the west. Modern Sudanese cuisine is heavily influenced by Arab and other Mediterranean cultures, which entered the country through trade and settlers during the Turco-Egyptian period. Mediterranean dishes now commonly served in Sudan include things like meatballs, pastries, and stuffed peppers. Women traditionally wear a garment called the tobe. The tobe is a long single piece of fabric that is wrapped around the body and draped over the head in a couple of different styles. Tiyab (the plural of tobe) can be in almost any color and can be made out of a variety of fabrics, depending on the occasion for which it is to be worn. Oftentimes, Indian saris are purchased and slightly trimmed to make tiyab for formal outfits. Tiyab are also sold in the Gulf and are often brought back to Sudan from there. Most brides wear red and gold tiyab for at least part of the wedding festivities. In the capital, most unmarried young women do not wear tiyab, and instead opt for long skirts and blouses, the Saudi-style abaya (long, loose dress, primarily in black), or Western clothing. Music is a central element of Sudanese social life. It can often be gendered. For example, one popular genre is called aghani al banat, or “girls’ songs.” Many of these songs do not have known composers/lyricists and are sung and re-sung in different permutations by different singers. Such songs play a crucial role in wedding celebrations during which songs will be sung to praise either the bride and groom or both (listen to an example here). Thematically, these songs often deal with love and marriage, although the sometimes very sassy narrators can subvert classical romantic tropes. Aghani al banat are most often accompanied by the daloka, a traditional Sudanese drum. Contemporary male singers sometimes sing traditional girls’ songs. Often, they do not change the gender of the narrator and sing from a female perspective (listen to an example here). Another important genre of Sudanese music is the songs of the haqeeba. These songs, written in the early to mid-twentieth century, are still widely respected today as examples of beautiful poetry. The haqeeba style grew out out madeeh, Sufi songs in praise of the Prophet. The haqeeba singers followed many of the rhythmic structures and rhyme patterns of madeeh, but they sang of romantic, rather than religious, love. The name of the genre, haqeeba, literally means “bag,” and it was named after a radio presenter who famously selected songs from his bag of music. Haqeeba music is still performed today, both in covers of the original songs and in more modern remixed productions. In the north of Sudan, one can still see the remains of the ancient Kingdom of Kush. The capital of the kingdom, Meroe, contains many pyramids built to house the bodies of royals after their deaths. The Meroe pyramids are the best preserved of the more than 200 pyramids in Sudan. People in Sudan continued to build pyramids for about 800 years after their northern neighbors in Egypt stopped the practice. The pyramids have been battered by looters; notably, Giuseppe Ferlini, a nineteenth century Italian explorer, took the tops off of 40 pyramids in his quest for treasure. He carried off the things he found to Italian and German museums. Radio Dabanga is a project of the Radio Darfur Network, a coalition of Sudanese journalists and international (media) development organizations, supported by a consortium of international donors, humanitarian community organisations and local NGOs. Radio Dabanga is conceived, operated and facilitated by Free Press Unlimited in the Netherlands. Sudan Tribune is a non-profit website based in Paris run by a team of independent Sudanese and international journalists and editors.